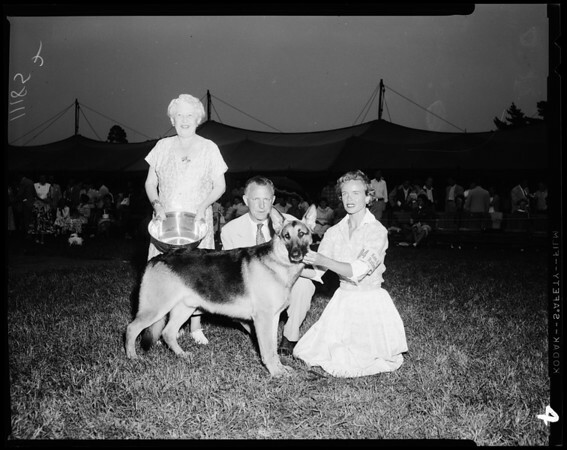 Supplementary material reads: "26th Annual Show -- Santa Barbara Kennel Club. Photographer: Joel Conway. Date: 1954-08-01. Film no. 1 -- A and B. Subject: Best Dog in show. Winning dog Ophaal of Crown Crest, owner Kay Finch of Corona Del Mar, imported 2 months ago from Holland. Trophy presented by Mrs. Sidney F. Heckert(? ), president Santa Barbara Kennel Club, and her daughter Mrs. J. Hall Bishop -- Judge Oliver Carley Harriman, of Beverly Hills. Film no. 2. Subject: Winner of Obedience Trophy -- 1st time awarded in the U.S. (Dog) Jigger's Babette of Broadleaf, standard poodle, scored 199 1/2 pts. out of possible 200 -- owned by Ted W. (and Elleanor) Maly of No. Hollywood -- presented the Earl Johnson Memorial trophy by Mrs. Earl Johnson. Film no. 3. Subject: Best of breed non-sporting. Dalmatian "Pepper of Velvet Pennies" owner Edward G. Loebrich of Hollydale -- Judge Mrs. L.W. Bonney, presented trophy by Miss Kathleeen Staples. Film no. 5. Subject: Best of breed Toys. Tiny Cindy Pomeranian, owned by Mrs. Blanche Y. Connors of Los Angeles, judge Mrs. Virginia W. Keckler -- trophy presented by Mrs. L.W. Bonney. Film no. 6. Subject: Sporting breeds winner. Cocker Spaniel 'Wilco's Mr. Barnes' -- owned by Mr. and Mrs. Walter A. Wilson of Van Nuys -- judge Virgil D Johnson trophy presented by donor Mrs. Durward Howes".